The oven is the heart of your pizzeria. Design and quality represent your restaurant. In one word: your success. problems of space, within new or existing furniture’s. Our knowledge and expertise, and our long experience is the best technical guarantee. Baking surface in highly resistance brick. (Old style!). Dome in vibrated refractory material with alumina cements. proportionate to the oven size. Suitable materials such as calcium silicate, expanded perlite, etc. 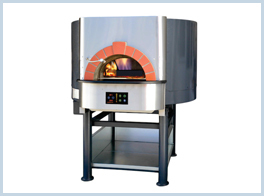 All our woodfired oven could be equipped with a gas burner. High tech made in simple way!